Item 1: Snow PlowsPlow Specifications:Easy hook-up and fast removal without having to go under your ATVFits on most ATV & UTVElectric winch lift systemFive positions blade quickly adjust without tools. Blade is adjustable 25 degrees to either sideOversized springs prevent damages to the bladeMany accessories available to improve your plow performancesBlade Gauge: 11 gauges .120 inchesItem 2: Snow Plow BracketsThe Click 'N' Go1 system allows for easy hook-up and fast removal without having to go under your UTV. 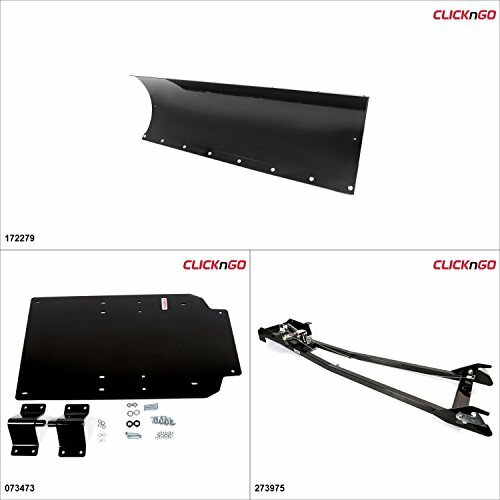 Efficient and durable, the Click 'N' Go system is ideal for summer or winter condition.Item 3: Plow FramesHeavy Duty Push Frame included:Front pivot reinforced with flat bar.Spring support are thicker and more suitable for the 72 inches plow.Hook up studs on mounting bracket are reinforced from 5/8" to 3/4". Plow frame extension for vehicles with tracks, sold separately. Part number 173997 Note for UTV kits: Need plow frame extension part number 173997 or else it will touch the tires when you put the blade in angle.